Do any of these titles interest you? If so, any comments would be appreciated. "In one model, a low-energy impact leaves the proto-Earth and Moon shrouded in a silicate atmosphere; in the other, a much more violent impact vaporizes the impactor and most of the proto-Earth, expanding to form an enormous superfluid disk out of which the Moon eventually crystallizes." The isotopic study used K239 and K241 and determined that the second theory was correct. "Supercritical fluids can flow through solids like a gas and dissolve materials like a liquid." "Wang ... predict[s] the Moon condensed in a pressure of more than 10 bar, or roughly 10 times the sea level atmospheric pressure on Earth." 1811-12 New Madrid Earthquakes, A NEO [Meteorite] Connection? Charles & others, I have questions about recent science news stories in red text below. A black hole destroying a star, [in] "stellar tidal disruption," releases an enormous amount of energy, brightening the surroundings in a flare. ... The WISE spacecraft, which maps the entire sky every six months, allowed the variation in infrared emission from the dust to be measured. ... [D]ust heated by a flare causes an infrared signal that can be detected for up to a year after the flare is at its most luminous. ... "The black hole has destroyed everything between itself and this dust shell," [leaving] a patchy, spherical web of dust located a few trillion miles (half a light-year) from the black hole itself. How are these infrared signals likely produced in reality? What would likely produce x-rays on Pluto? Would it be from ionization as in lightning or electrical discharges? Does your earthquake model suggest that hydrogen is produced? Is this consistent with your model for Earth before the supercontinent formed? HR8844 [is a] superficially normal A0V star [but its] light elements are under-abundant [and] very heavy elements are overabundant [so] the star should be reclassified as a chemically peculiar star. ... Besides their chemical composition, [such stars] have magnetic fields and experience very slow rotation with an average velocity of 29 km/s, which leads to extremely sharp-lined spectra. What do you think type A stars really are? And what kind of object would have overabundant heavy elements? Could it be an exotic? With the slower rotation or the properties of the star it seems as though its showing its core more.. It has a whole bunch more iron lines... A solid core star would fit the properties outlined in the paper.. Thanks Upriver. CC's comment would be interesting, since your models are fairly different. Lloyd said: By the way, I thought you had said lately that the maximum size for a star should be about 1.4 solar masses. Do you actually think type O stars can be so much bigger? [Charles replied] I'm thinking that O and B stars are all multiple stars that have been misinterpreted as being single stars. I found these excerpts from a forum discussion which suggest there's something wrong with Type O. I haven't looked for problems with Type B stars yet. Celestia's database contains several O stars closer than Zet Oph, but none that are convincing: they all have very low radii calculated from their assigned spectral class, apparent magnitude and parallax, suggesting that there's something wrong with either the spectrum or the parallax. What about Zeta Ophiuchi then? Parallax measurements give an estimated distance of roughly 366 light-years (112 parsecs) from the Earth. This star is much closer than Naos, if the parallax isn't too messed up by the high proper motion. Of course you are correct. With a mass of over 20 solar and a distance of between 400 and 500 light years it is unfortunate that zeta ophiuchi is surrounded by so much dust otherwise it would be easily in the top ten ... brightest stars. Charles, here are some ideas on formation of the Moon. A stratified layer beneath the rocky mantle ... appears in seismic data.... [T]he stratified layer ... some 200 miles thick and ... 1,800 miles below the Earth's surface ... [is] believed to consist of a mix of iron and lighter elements, including oxygen, sulfur and silicon. What do you make of that? It surprises me that the evidence could be so deep, but I guess it makes sense after second thought. If the whole mantle was previously another planet, then most of that planet ended up as Earth's mantle and the rest split off and became the Moon. I guess the 200 mile thick layer of iron could have been the original core of the soft-landing planet. Right? I guess just the granite continental areas of Earth's mantle would be from the planet though, not the entire mantle. The NT model also generalizes easily to explain related star types, such as black holes, neutron stars, pulsars, magnetars, quasars, blazars, BL Lac objects, and white dwarfs. I replied: Aren't AGNs also NTs? Some galaxies have bipolar jets and strong magnetic fields, so I thought they were NTs too. And why do you include neutron stars here? Shouldn't the term be in quotes, since you don't believe they're really neutron stars? Charles replied: I think that AGNs are aggregates of exotic stars. In other words, the bipolar jets are the sum of the jets of all of the quasars. I replied: That's really interesting that you think AGNs are quasar clusters. Do you think there's likely to be other NTs involved too, or just quasars? What observations led you to suppose that AGNs are quasar clusters? How do you think all or most of the quasar jets would become aligned with the galactic poles? Is it because of their strong magnetic fields? Would any of the quasars in AGNs attain highly elliptical orbits? And do AGNs seem to contain normal stars as well as quasars? By the way, I think you said recently that you don't know of a size limit for quasars or NTs, so wouldn't it be possible for a galactic bulge to be a natural tokamak like a quasar? Here's Charles' diagram of how jets are produced from toroidal natural tokamaks. The two colored circles are the cross section of a torus. The arrows indicate radiation I think. This shows that the radiation is concentrated mostly at the two polar openings of the torus, forming bipolar jets. ... [E]ven with two neutrally charged atoms, molecule-building is easier in an external electric field, which chases all of the electrons to the far sides of their atoms. This makes electric dipoles out of all of the atoms, with the negative side of one facing the positive side of the other, creating an electrostatic attraction between the atoms. ... This same principle appears to manifest itself on a much larger scale — that of stars. ... [J]ust like dusty plasmas, stellar systems are charged bodies surrounded by plasma sheaths. If our Sun were involved in such a collision, our spherical heliosphere would be stretched into a coma by friction with other heliospheres or with interstellar plasmas. Since the heliosphere has a slight positive charge,10,11 and assuming that other stars have a similar set-up, we have the same configuration as in Figure 3, where there will be an electrostatic attraction between stars far stronger than gravity. I think Charles said in another paper or maybe on this forum that there doesn't really seem to be a heliopause as the science media have been claiming, so I'm wondering if he thinks there is one, but it hasn't been found yet, or if there is no heliopause at all. If the latter, then there would be no heliosphere, because the heliopause is the boundary of a heliosphere, and without a boundary there's no definitive shape etc. Yes, the electric force, in the "like-likes-like" configuration, appears to be the organizing principle of the Universe, and is crucial to understanding chemistry, star formation, and galaxy formation, to name just some of the scales at which the matter falls into this configuration. Lloyd wrote: I think Charles said in another paper or maybe on this forum that there doesn't really seem to be a heliopause as the science media have been claiming, so I'm wondering if he thinks there is one, but it hasn't been found yet, or if there is no heliopause at all. If the latter, then there would be no heliosphere, because the heliopause is the boundary of a heliosphere, and without a boundary there's no definitive shape etc. I'm saying that there isn't any termination shock at the heliopause as the mainstream has it. Instead of being under high pressure, with even more pressure at the heliopause, the heliosphere is actually less dense than the interstellar medium, and the heliopause is a near-perfect vacuum. So I'm just characterizing it very differently from what the mainstream is saying. The heliosphere is a positively charged electrostatic bubble, blown not by hydrostatic pressure, but by its electric charge. So it's like a Debye sheath. It looks like the ring of counter-streaming ions is there like your model describes, and the bipolar emissions are there, but it looks like there's also expanding rings forming around the inner ring, and there is a bright star in the middle of the ring. I guess there's also a cloud like vapor around the whole thing which is moving mostly to the right due to the magnetic thruster effect of the ring moving to the left. What do you make especially of the inner star and the expanding ring/s? Lloyd wrote: What do you make especially of the inner star and the expanding ring/s? The inner star is the "natural tokamak". The expanding rings are from flare-ups in the NT. Once the magnetic thruster kicks in, the star is moving through its environment, in which case it is scavenging matter in its path. Inconsistencies in the density of this matter will produce flare-ups. Lloyd wrote: 1811-12 New Madrid Earthquakes, A NEO [Meteorite] Connection? most importantly, where the maximum eclipse point in 2017, pairs with the New Madrid earthquake sites. If there is any correspondence between new/full moons and earthquakes, the effect should be intensified under the eclipse conditions. Doesn't matter whether it is electrical forces, or gravitational tides. The question I have for you is then about the link between New Madrid earthquakes and Meteorites. Is it more likely that the new/full moon somehow triggers earthquakes, and also independently meteors cause earthquakes? Or could it be that the alignment causes earthquakes, and then the meteor activity is actually a result of the resulting electric discharges. This would be a question for C.C. too. - The New Madrid seismic zone earthquakes of 1811-1812 may not have been caused by strictly run-of-the-mill seismic activity. This is a study into the possibility that some Near Earth Object (NEO), such as the Great Comet of 1811, was an outside-the-box crustal stressor. If a NEO involvement is found, then some fear of the unknown about the timing of the next big one may come to be dispelled. First Charles explained that tides are electrical forces at http://qdl.scs-inc.us/?top=9925. - If we step through the whole process, we can easily see where this is happening. - Tectonic motion builds up pressure at the fault. - The rigid crust buckles under the pressure. - The elevation of the crust reduces the pressure underneath it. - The reduction in pressure reduces the degree of ionization. - De-ionization motivates an electric current through the fractured crust. - The electric current causes ohmic heating in the crust. - The ohmic heating causes the crust to expand. - The expansion increases the buckle. - The one other factor that increases the chance of an earthquake is a new moon, when the tidal forces are the greatest.18,19 In the standard model, this doesn't make sense, as the gravitational potential causing stress at the fault is reduced by tidal forces, and the quake should wait for low tide and a moon in its 1st or 3rd quarter. But if tidal forces increase the crustal deformation, they are contributing to the force feedback loop that causes the runaway expansion of the crust. So, although New Moons increase risk for quakes, an eclipse seems hardly any different from other New Moons, which occur every month. So it seems unlikely that the eclipse will trigger another New Madrid quake, unless there is something about eclipses that increase electrical forces even more than normal New Moons, which seems unlikely offhand. An impact seems more likely to trigger a quake, but I don't think there's a correlation between impacts and eclipses or New Moons. Charles, I have a few more questions. I just noticed this Ring around the Star Fomalhaut in a TPOD at https://www.thunderbolts.info/wp/2012/04/13/a-ring-of-truth. Do you think that would be a Tokamak without visible jets? Or something else? Would some Tokamaks have no jets? Would jets likely fade away in all NTs? How would a star get in the center? I just found this today: [Two concentric] Rings around young star http://phys.org/news/2016-12-young-star-planet-formation.html. It says the rings are gas, but plasma is often considered a gas too. I just came across this too, and wonder if you've heard of it before & if your model already explains it, as I think it does: Possible solution to why outer 5% of sun spins more slowly than interior http://phys.org/news/2016-12-solution-long-standing-solar-mystery.html. Lloyd wrote: So, although New Moons increase risk for quakes, an eclipse seems hardly any different from other New Moons, which occur every month. I "think" that I agree. I'm thinking that the only difference between a New Moon and an eclipse is that in an eclipse, there is a small region of the Earth (surface & atmosphere) that isn't getting the photo-ionization that it usually gets. So there you'll have this non-ionized hole surrounded by stuff that is at its normal degree of ionization for that time of day. Since conductivity increases with ionization, and decreases with de-ionization, the hole will be less conductive. So there won't be a stronger electric current through it -- there will be less current. 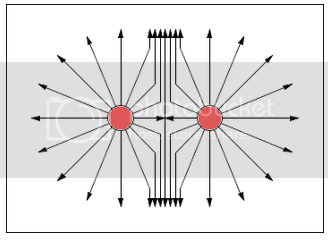 So what is the significance of there being a thin resister surrounded by conductor? Quick answer: I don't know. Lloyd wrote: I just noticed this Ring around the Star Fomalhaut in a TPOD at https://www.thunderbolts.info/wp/2012/04/13/a-ring-of-truth. Do you think that would be a Tokamak without visible jets? Or something else? Would some Tokamaks have no jets? Would jets likely fade away in all NTs? How would a star get in the center? In my model, all stars are formed the same way, by imploding filaments. (Imagine a rubber band that has been stretched tight and then let go.) At moderate velocities, you'll get one big star in the center where all of the matter collides. At greater velocities and in stronger galactic magnetic fields, Lorentz forces deflect the imploding filaments away from a head-on collision, since stuff coming in from one direction gets deflected one way, and stuff coming in from the other direction gets deflected the other way. The result could be two binary companions instead of one big singleton. But at extreme velocities, the imploding filaments get separated into positive & negative strands, and the positive strand from one direction collides with the negative strand from the other direction, and vice versa. I then show how these splits streams can resolve into a continuous ring, with positive charges going around the circle in one direction, and negative in the other. Counterstreaming annular plasma would suggest a tokamak, so that's my model for the exotic stars, such as quasars. Hence there are three possible outcomes: one big singleton, two smaller binary companions, or one really big toroidal plasmoid. Now, are these outcomes mutually exclusive? In other words, could you get a main sequence star in the middle, with a toroidal plasmoid encircling it? In my model, there isn't any great reason why this would happen, and the chances of it would be slight. You'd have to have some of the plasma going slow enough to simply collide head-on with its counterpart coming in from the other direction, to form the single main sequence star in the middle. Then you'd also have to have some of the plasma coming in at extreme velocities, getting separated into positive & negative strands that can resolve into a toroidal plasmoid. So you have two different sets of initial conditions. Not impossible, for all of that to happen in the same place at the same time, but not likely either. More problematic would be keeping them together after the fact. There wouldn't be any reason for these things to travel together after formation. So from the theoretical perspective, this configuration would be rare2. Of course, if we have only one known instance, out of all the stellar systems that have been cataloged, that's rare2. But I'm not saying that there is any reason for this configuration to occur -- I'm just allowing the possibility. Lloyd wrote: I just came across this too, and wonder if you've heard of it before & if your model already explains it, as I think it does: Possible solution to why outer 5% of sun spins more slowly than interior http://phys.org/news/2016-12-solution-long-standing-solar-mystery.html. They came up with some more mainstream astrobabble, invoking relativity because they couldn't explain it any other way. He explains that these flux ropes or tubes from the Sun to the inner planets are imaginary. It's the electric current sheet from the Sun that has magnetic effects. Electrons travel helically like the shape of a coil, so that's like a tubular path. That's all.